A new study by the Taub Center for Social Policy Studies in Israel examines how pupils advance through the various streams of Israel’s education system from first to eighth grade, in order to check the share of pupils with irregular patterns of progression: skipping grades, repeating grades, being dropped down to an earlier grade, or some combination of these patterns. Taub Center Principal Researchers Prof. Alex Weinreb and Nachum Blass, found that irregular patterns of progression are more common in the Haredi sector, and, in particular, in the Ma’ayan Hahinuch Hatorani education system. Likewise, the share of irregular patterns of progression has increased over time in the Haredi education system, while in other systems it has remained relatively stable or declined. The researchers argue that unusually high rates of irregular progression are likely a sign that official records of grade progression reflect the school’s organizational and management needs rather than students’ individual educational needs. Boys have higher rates of irregular advancement patterns than girls: In the Hebrew state school system, about 5% of boys repeated a grade versus about 3% of girls; in the state-religious and Arab system, about 9% of boys repeated a grade versus 6% of girls. The highest rate of irregular advancement patterns was in the Haredi education sector: about 20% of boys who began their education in the Exempt system (which has little if any oversight by the Ministry of Education) repeated a grade; in the Haredi Recognized system (schools that are partially financed by the state with partial oversight although they are not officially part of the state system) about 23% of pupils repeated a grade; in the Independent education system, about 26% repeated a grade; and in the Ma’ayan Hahinuch Hatorani system, some 38% of boys repeated a grade. In an examination of how many years it actually takes to complete a single grade in school in each education system, it was found that there were statistically significant differences among the various educational streams. The average pupil in a Hebrew state school takes 1.015 years to complete a grade and advance to the next grade. In state-religious schools, this was 1.025 years while in Arab schools, it was 1.029. In the Haredi education system, it took 1.05 years in the Independent and Exempt schools, about 1.06 years in the Recognized but not official schools, and about 1.09 in the Ma’ayan Hahinuch Hatorani schools. It is quite common to hear about irregularities in pupil registration in the education system, although frequently these claims are based on single incidents. Prof. Alex Weinreb and Nachum Blass, principal researchers at the Taub Center, decided to examine the question in a more comprehensive and methodical way by looking at pupil advancement in grades 1 to 8. The research is based on Ministry of Education data for all pupils born between 1994 and 2000 and enrolled in grades 1 through 8 between 2001 and 2015. For the first time in Israel, it looks at the differences in the expected advancement patterns of pupils (one school year per grade) and the actual patterns. Irregular patterns in the education system include skipping a grade, repeating a grade, being dropped down to a previous grade, and in exceptional cases, some combination (like repeating a grade and then skipping a grade). In theory, these patterns are meant to answer individual educational needs for those who for various reasons did not complete a grade successfully or performed at a particularly high level and needed the challenge of a higher grade. However, in the researchers’ view, the inflated share of pupils in irregular advancement patterns – and in particular of pupils who repeated a grade and then skipped a grade at a later time – suggests that these exceptions from the normal pattern do not serve the individual needs of pupils but rather the organizational needs of the institutions. Boys advance in irregular patterns at a higher rate than girls; the highest rate of irregular patterns is in the Haredi educational sector. The data in the Taub Center study show that, in general, boys go through the system in a less standard fashion than girls. The likelihood of a boy repeating a grade, being put back in a previously completed grade or skipping to a higher grade is almost twice that of a girl: about 5% of boys repeated a grade versus about 3% of girls in the Hebrew state education system, and in the state-religious system these figures were about 9% of boys versus 6% of girls. This figure is in line with previous research that showed that in general, the share of boys among the population of those with special educational needs – both those with disciplinary and educational needs – is higher than the share of girls with special needs. 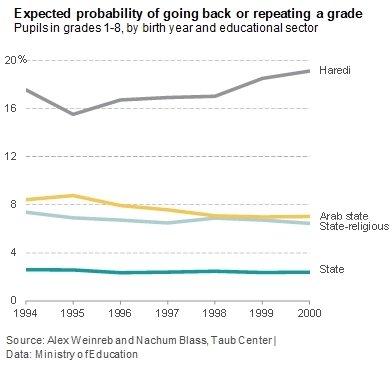 The data also show that the lowest likelihood of irregular advancement patterns is in the Hebrew state educational system. In this stream, less than 1% of boys in grades 1 through 8 went back a grade, about 5% repeated a grade and about 4% skipped a grade. Among girls, the likelihoods were about half that of boys. In contrast, the most irregular advancement patterns were found in the Haredi educational system. About 20% of boys who began school in Exempt educational institutions repeated a grade, and about 10% repeated and then skipped a grade. In the Haredi Recognized system about 23% of pupils repeated a grade and about 14% repeated and then skipped a grade. In the Independent system, about 26% of boys repeated a grade and about 18% repeated and then skipped a grade. In the Ma’ayan Hahinuch Hatorani schools, the highest rates of irregular advancement were found: about 38% of boys repeated a grade and about 25% repeated and then skipped a grade. 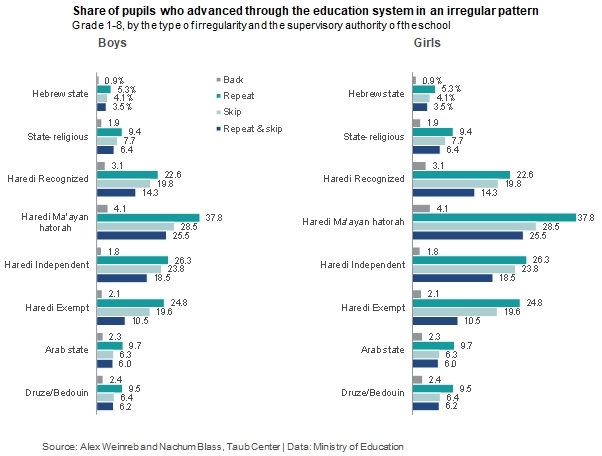 In the Arab education system (including Bedouin and Druze) and in the Hebrew state-religious system, the share of boys with irregular advancement patterns is higher than in the state system and low relative to the Haredi system. About 10% repeated a grade and about 6% repeated and then skipped a grade. Among girls, the rate of irregular advancement patterns is lower, although the highest share remains among girls learning in the Haredi educational system. In the Haredi Recognized schools, about 13% of girls repeated a grade and about 9% repeated and then skipped a grade. In the Ma’ayan Hahinuch Hatorani schools, about 21% repeated a grade and about 15% repeated and then skipped a grade. In contrast, in the Independent schools – where most Haredi girls study – advancement patterns are most similar to those of girls in the Hebrew state-religious system and the Arab, Druze and Bedouin system: about 7% of girls repeated a grade and about 5% repeated and then skipped a grade. In the Hebrew state system there were the lowest rates of irregular patterns: only 3% repeated a grade and about 2% repeated and then skipped a grade. Sector differences remained unchanged even after controlling for the location of the school. In their research, the Taub Center’s Weinreb and Blass examined whether these patterns of student progression have change over time. The findings show that in Hebrew state schools, the patterns are similar for the seven birth cohorts that were studied (less than 0.5% of the overall cohort), with similar patterns in the state-religious and Arab systems. In contrast, in the Haredi sector, there have been substantial changes over the years and the irregular advancement patterns have become more common with time. For pupils born in 2000, there was a 50% higher chance of being put back in a previously completed grade or repeating a grade than for those born in 1995. To gain additional perspective, the Taub Center research looked at the number of years it actually takes to complete a grade, taking into consideration the particular patterns in each education system. It showed that the average pupil in the Hebrew state system takes 1.015 years to complete a grade and to advance to the next grade. In state-religious schools, pupils take 1.025 years. In Arab schools, the figure is 1.029. In the Haredi education system, the figure is the highest: 1.05 years are required per grade in the Independent and Exempt schools, 1.06 years in the Recognized but not official schools, and about 1.09 years in the Ma’ayan Hahinuch Hatorani schools. Among girls, the ranking across systems was similar, though the absolute differences were smaller. The central finding of the Taub Center research is that there are substantial differences in the share of pupils with irregular patterns of progression depending on the school sector and supervisory authority. The most irregular patterns are found within the various Haredi schools; the most standard patterns are in the state school systems. The highest share of irregularities was found in the Ma’ayan Hahinuch Hatorani education system, particularly among boys. Weinreb and Blass agree that closer supervision of schools would prevent reporting of over-enrolled classes that require full funding when, in fact, the classes are smaller, and could even reduce the minimum number of years that pupils are in the education system. Public spending on education could be reduced in this way. The Taub Center for Social Policy Studies in Israel is an independent, non-partisan socioeconomic research institute. The Center provides decision makers and the public with research and findings on some of the most critical issues facing Israel in the areas of education, health, welfare, labor markets, and economic policy in order to impact the decision making process in Israel and to advance the well-being of all Israelis. For details, or to arrange an interview, please contact Anat Sella-Koren, Director of Marketing, Communications and Government Relations at the Taub Center for Social Policy Studies in Israel: 050-690-9749.